Mahbubani must be surprised by the new US administration, which decided to send their Secretary of State and former presidential candidate Hillary Clinton to what he supposed to be second-rate destinations in East Asia: Tokyo, Jakarta, Seoul and Beijing are the capitals Clinton will be visiting on her first trip abroad this week. It is possible that the newcomers in the White House have read Mahbubani’s advice to “prioritize meetings across the Pacific over meetings across the Atlantic”. 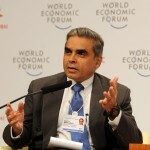 However, Mahbubani is likely to remain skeptical. In his article, he criticizes the hub-and-spoke policy of bilateral arrangements the US has been pursuing with its partners in East Asia. Rather than relying on an US-centered Asia-Pacific economic and security architecture, or worse, preventing East Asian countries from creating strong international institutions among themselves, as US policy makers have done in the past, he urges the new US administration to promote the nascent East Asian frameworks for regional cooperation, such as APEC and ASEAN. “America”, in the words of Mahbubani, “should rediscover the virtue of multilateralism”. By sending Vice President Joe Biden to the Munich Security Conference last week, the Obama administration gave a clear signal that it does not intend to prioritize East Asia over Europe. It seems that for the White House there is no trade-off between emphasizing Europe and emphasizing Asia. After the Bush administration’s neglect of diplomacy it is possible for the Obama administration to say: “We prioritize both, meetings across the Pacific and meetings across the Atlantic”. Whether this, in the case of East Asia, also includes encouraging multilateralism is a question unanswered so far.